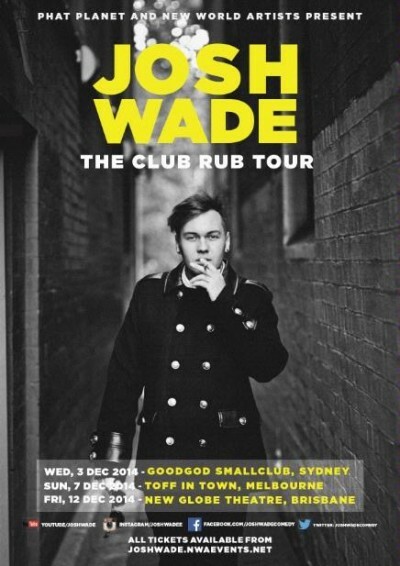 Goodgod are proud to have one of Australia’s freshest comedy talents Josh Wade gracing our stage! Due to demand, a second show has been announced! At just 19, Josh Wade uses a combination of his sharp wit and YouTube to join a new breed of new media performers sending their global audiences “into a f**king frenzy”. Announcing three special shows, he’ll take the laughs offline in Sydney, Melbourne and Brisbane this December. Exploding at age 13 through Youtube, Josh Wade has maintained his status as an Internet staple, and managed to evolve into a well-honed stage comedian throughout his teenage years, adapting online material into a one hour stand-up comedy show. In 2014 Josh performed his debut show I’m Josh Wade at the Melbourne International Comedy Festival and Sydney Comedy Festival, receiving rave reviews for a string of 33 sold out shows. Now, it’s time to introduce Wade to audiences in the intimate atmosphere of Goodgod.